Sorry, Facebook: better start searching for another real-time traffic provider to buy up, because Google just confirmed it now owns the one you had your eye on. In an official blog post Tuesday, Google confirmed it's now the proud owner of Waze, the Israeli provider of crowdsourced traffic data rumored to have rebuffed recent acquisition offers from Apple and most recently, Facebook. 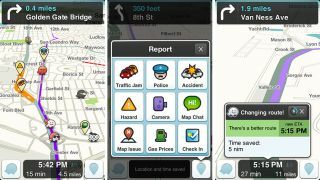 Waze crowdsources traffic and mapping data in real time from users of its mobile apps, who also contribute gas prices and the location of accidents or known police speed traps. While terms of the deal were not disclosed, a weekend report out of the fast growing startup's home country claimed Google bumped Facebook out of the running with an offer of roughly $1.3 billion (UK£0.84B, AUD$1.36B). While Google plans to use Waze to further enhance its own Maps solution, the startup will remain in Israel as a separate entity - at least for now. "We welcome [Waze] to Google and look forward to working with them in our ongoing effort to make a comprehensive, accurate and useful map of the world," Google Vice-President of Geo Brian McClendon said. "We'll also work closely with the vibrant Waze community, who are the DNA of this app, to ensure they have what's needed to grow and prosper." Google declined further comments on how Maps might be improved by the acquisition, but did briefly mention plans to enhance its existing search engine with "some of the traffic update features" provided by the smaller company.